a cd that will almost certainly intrigue and enchant jazz lovers everywhere. This collaborative venture features primarily the compositions of Gina Schwarz who composed and arranged this music specifically for harpist Richard Oesterreicher whose convincing and soulfully intuitive playing reflect his many years of playing in diverse jazz settings. His interpretations of the often Latin-tinged or Oriental-influenced compositions of AIRBASS are uniquely memorable for his soulful way with melody and improvisation. 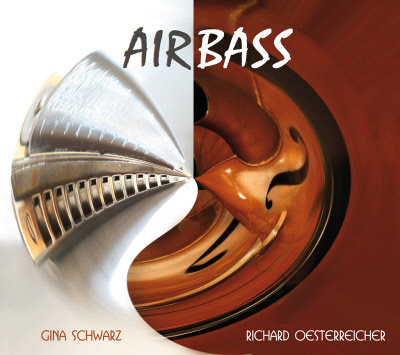 The Gina Schwarz bass solos throughout this recording clearly reflect her sensitive affinity with Richard Oesterreicher’s moving solos, and they are a reminder of her growing stature as one of Europe’s outstanding bassists. The songs of AIRBASS utilize varying formats from duo to sextet and include a string quartet on some of the numbers. For composer Gina Schwarz the principal challenge was to combine the instrumentation and the interplay between the harp and the harmonic support provided by guitar, vibraphone, and piano and the added occasional coloration of bass clarinet as well as string quartet. How well Gina Schwarz met this compositional and arranging challenge and how splendidly Richard Oesterreicher was able to take advantage of all the varying musical elements that comprise AIRBASS is demonstrated throughout this new and different recording which in so many ways is a triumph for bassist-composer Gina Schwarz, harpist and musical explorer Richard Oesterreicher, and all the other stellar musicians involved in this collaboration between two daring and innovative music makers. The poetry included in the album booklet is a perfect companion to the music, itself, and it invites the listener to visualize the new and exciting world of AIRBASS, a soulful and, yes, touching recording that one can only hope will be the first of many more to follow.